One of your PIFFs is corrupt, or there's some kind of conflict. Delete the translations folder inside User, that should not be there, it's already outside. Can you send what's in their config.ini inside FreeSO/Content/config.ini? For some reason it thinks it's in the old folder. I'll work on something to fail proof this, will come in an update soon. You can change the link in StartupPath to C:/Program Files/FreeSO/TSO/TSOClient/ or wherever TSO is located now. I thought that value would be updated by the game or the installer, but seems like it's not. It is updated by the game is your registry is intact. Installer has been updated to install the latest launcher version. Alessandro Needs A Server, JWofles and Oniji Abukara like this. When will the 32-bit version be available? Tori Sim and Gabriel_L_Ferraz like this. 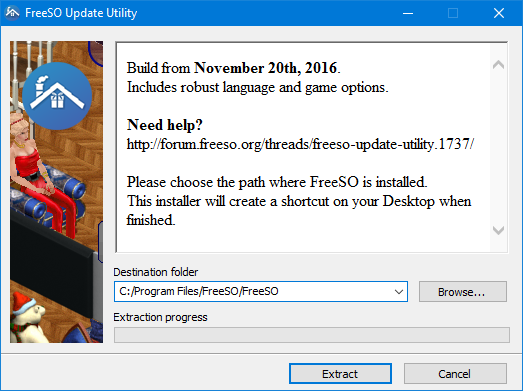 Can I do the translation of the FreeSO Update Utility to Portuguese Brazil? If your launcher bugged out while updating, please reinstall it. There was a server side change that did not agree with the launcher's requests (this happened to 5 people from what my logs tell). Becky with the good hair, Gabriel_L_Ferraz, Tori Sim and 1 other person like this. When will the 32-bit version come out? Currently uploading the x86 LAUNCHER installer. Will be uploaded in a few. Becky with the good hair, Gabriel_L_Ferraz and JWofles like this. Current users will receive update 1.5.3 through an ordinary update. Becky with the good hair, Sir Telias, Gabriel_L_Ferraz and 1 other person like this. Thanks for building this wonderful tool. Reminds me of the good ol' TSO days.